So, we've all had encounters with them Jejemons - from random text messages, Friendster friend requests (back in the day, you remember? ), Facebook status updates, and other Social Networking site - and now they have conquered mainstream media - with a fast growing viral popularity that rivals MelaSon or OchoOcho. They are now (unfortunately) part of Philippine Culture and even in other parts of Asia. 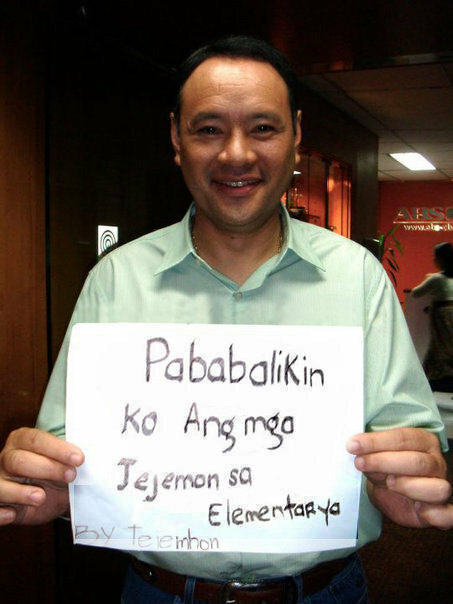 During the Philippine Presidential Election campaigns, we saw Jejemon being used as a campaign tool - like this photo of Sec. Gibo Teodoro. I also heard VP Candidate Jejomar Binay was turned into Jejemon Binay. Here goes... I apologize in advance for any headaches this post will induce - it's all for academic purposes. Lolz!,,,Jejejeje!~~jeje!! Read on! Jejemons use numbers f0r lett3rs - just b3c4use th3y're cut3r! So I started with the obvious ones, exchange letters for numbers - "a" can be "4", like with a sl4nted psychedelic look to it. Exchange "e" with "3", but not 4ll the tim3. You c4n still us3 the normal "e", sometim3s. 3xh4nge y0ur capital "G" with "6" and sm4ll "g" with "9" - it m4k3s s3nse ri9ht? You can use "2" in pl4ce of "to" or "4" inste4d 0f "for" 4nytim3 y0u f33l like y0u n33d 2 do it... 4nd finally, us3 th3 numb3r "0" instead of the letter "o", just b3caus3 it's cut3r th4t w4y. Co0l! 63ttin9 th3 h4n9 0f it n0w? L3t's g0 n0w 2 symb0ls! Try usin9 "+" in pl4c3 of "t" sinc3 i+ lo0ks th3 s4me anyw4y. R3pl4cing "i" wi+h "!" is jus+ w0nd3rfully art!st!c 4nd !ngen!0us, d0n't y0u 4gr33? By th3 w4y, an "a" c4n als0 be r3pl@c3d with an @ symb0l, d3p3nd!ng 0n h0w difficult it will bec0me 2 c0mpr3hend. I m3@n, d0n'+ us3 @ wh3n y0u're wr!tin9 an 3ma!l @dd3ss! To g3t a wave-l!ke effect on your texts, use UPPER and lower case letters alternately. And wh!l3 w3'r3 4t !t, l3t's dr0p th3 "s" 4 s0m3 w0rDz and üs3 "z" inzte4d. Zpr!nkl3 i+ ar0und y0ur s3nt3nc3z 2 mak3 it m0r3 v!br4nt aNd in+er3sting 4 th3 r3aD3r. J3jem0nZ aLs0 uSe a Wh0le l0t of pUnCtü4t!0n m4rkz,,, iMpr0p3r ~uSa9e,,oF''c0mM4s iz f0r3m0st. ExCl4ma+i0n po!ntz aRe a müzt,,!! 4n0tH3r j3jeM0n wR!+N9 rUl3, If~ tH3RE Ev3r~ w@z oNe IS - AbBr3v!8! Lolz!~ sINc3~ It wuz OrI9In4llY mEanT~ 4 tXT mEsSGEz, D ShORTEnInG Of~ wOrDZ iz å MüSt~ w3lL, eSPeC!ally sinC3 åNoTH3r~ rulE oF jEjemON wRitnG iz,, d adDiN9 Of A G3NErOüZ aMOUNT of coMMaz, ElLIpseZ, nD Wha+vER~ eLse~. uSe "u" INsT3ad of "you", "d" INsteAD~ oF "the", "w/" f0r "with" aND dr0P lett3rz~ WeNeVER pOssIbLe. Jejemons laugh heartily at every opportunity! Jejeje! jeJemONz arE a~ Hpi BunCH. Jejejeje!! ~ thEY aRE @ctUallY nmeD dAT w4y BeC~ oF Th3ir~ VERy unIQUe l4ugHt3R~ - jejejeje! ThiZ TyP3 oF L4u9hT3R, sUm s@y, wuz oRig!nAllY uSeD bY oNl!ne mmoRPG g@meRz wHil3 tH3y pUmMeL oPp0n3nts 2 d gRoUnD. Jejejejeje! L@sTly, jej3m0nz aRe,, kN0wN 2 b v3rY~ k!nD nD r3speCtfUl, d3sp!te tHe!r wRiTin9 stYl3. It iz n0t uNuSuAl 4 j3jemonz 2 eNd aNy sent3nz w/ "po" - a s!gn of~ r3spEct 4 Filipinos. TH3r ar sveral vRsi0ns- frm d s!mpl3 "poh" 2 d mor iNteRestn9 "poewh" 2 d fLaMboUyant~ "phoewhzz" - tAk3 ur piCk pohw!!! !~~~ jejeje! You are now a Jejemon! That was quite a challenge to write (and READ, i bet!). Now writing in jejemon doesn't end in the text construction - it is much more than that - something I can never teach. Well, first that it is mostly in Tagalog-English or Tag-lish. Nonetheless, I hope you were able to learn a thing or two from this exercise - at least now, you'll be able to read jejemon! Why don't you go ahead and try it out in the comments section? Hehe! Good luck and go forth, new jejemons! t3nChu xo muCh n0w i unD3r$t@nD..nD i wiLL b a jEj3mOn f@N4ever nD ever..
"I LEAVE it to you guys..."